Would love to get some ideas for me to get my last pet (well, I only keep 1 pet active normally, so in theory I could get a couple more if the suggestions are really good). My last tame was Acroniss which I had been waiting for hours when I had to go out and do some gardening. Snuck back in and noticed he was in, so a successful tame. 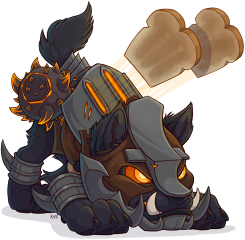 Everyone needs a toaster wolf. I agree. Toaster wolf is a must have, I think. Such a cool pet. Interesting. But it requires doing all the Tanaan quests to unlock and then you have 2,000 people flying around and killing everything instantly. I imagine it would have been a lot easier before flying was launched. You don't need to unlock anything, just be lv 100. All good. Now have me an Iron Wolf. Not sure I would have thought about trying to tame one, given how they look. Just need a name for it ! I would have said Fel Wolf over Iron Wolf, but that's just me. Well, its been a while but Im back playing the game and once again Im running out of stable space. Anyway, would love any help because I have 2 spots left and have only got 1 pet from Legion. Also, maybe suggestions on non-Legion pets to consider as well ! Maybe suggest 5 and I will consider. Of your non-exotics, I'd suggest releasing one of your runed dogs, the maned wolf and the saber worg. For your exotics, I'd suggest releasing some of the easily retameable ones, like some of your SB porcupines or one of the Mount Hyjal SB cats. Gara and Ghostcrawler are also easy to reacquire. For new tames, I think the legion Basilisks and the sandreaver Silithids are very striking, and the rare Thunderstomp stegodon is an attractive option in the new Scalehide family. As for the Porcupines, I think I will hang on to them. They were tough ones to tame. Do you really think Ghostcrawler was easy to tame? Deeps of the ocean in the middle of nowhere in a zone out of the way from everywhere? I love the look of the Thunderstomp Stegodon. I think that will be next on the list. Ive also seen a Silithis rare which looks nice. Do you really think Ghostcrawler was easy to tame? Deeps of the ocean in the middle of nowhere in a zone out of the way from everywhere? But that's precisely why Ghostcrawler is easy to tame He's almost always there, even at the beginning of Cataclysm, even now with CRZs. So which Silithus rare are you interested in? Acroniss, Grubthor, one of the hive rares? I have Acroniss and Karapax but was thinking Manax looks cool, or go for Toxx, or maybe even Prince Lakma. Not a whole lot of Stable space though. I keep looking at my list and only the 2 I mention above are ones I can handle abandoning. And to think we used to only have a couple of free slots ! !